More than 20 people have gone to the Federal Attorney General’s offices to give statements regarding the ambush in which human rights defenders Jyri Antero Jaakkola and Alberta Cariño Trujillo were murdered. Nearly five months after the crime was committed, the authorities have not identified those responsible. Their families demand justice. The lives of these activists were abruptly cut short by a paramilitary group’s bullets in the vicinity of San Juan Copala, Oaxaca. He would have returned to his country in 2011 to travel on the sailboat Estelle, promoting “just commerce” and bringing humanitarian aid to developing countries. These were Jyri Antero Jaakkola’s plans, the young Finn killed by a shot to the head in the community of La Sabana, Oaxaca this past April 27. Jyri and Alberta Cariño Trujillo were traveling in a van as part of a caravan heading to the Autonomous Municipality of San Juan Copala. They lost their lives in an ambush carried out by paramilitaries from the Union for the Social Well-Being of the Triqui Region (Ubisort). Up to now, the authorities from the Federal Attorney General’s Office have not detained those responsible for the crime. 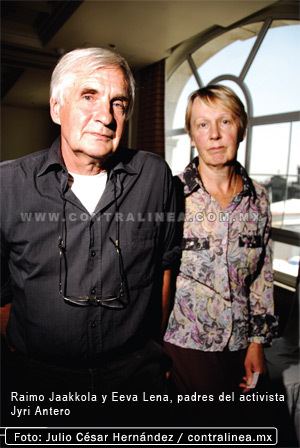 In an interview with Contralínea, Eeva-Leena and Raimo Jaakkola recalled the life and work of their son Jyri, who they last saw in 2009 when he decided to go to Mexico to learn about the traditional self-governance practices of indigenous communities in Oaxaca. Blue eyes, white complexion, skinny, Eeva Jaakkola is the first to speak; meanwhile Raimo loses himself in the memories of the infancy of his second child. “He had many friends. He was always doing something. He was very quiet. He liked to listen to others; to interact with people. He grew up with a strong sense of justice and equality: things that were discussed at home, that my three children were raised with. 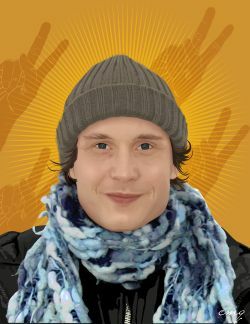 An athlete and “in love” with art, Jyri studied painting as a teenager. At age 23, he began studying political science at the university in Turku, on the coast of Finland. He then joined Uusi Tuuli, an organization that promoted a project selling Oaxacan coffee in Europe. He was 33; he wanted to travel the world and “to continue his work in other places, although he knew his home was in Finland,” says Raimo. “He was well-prepared to go to Mexico: he went to trainings, he took account of the risks involved in his work. Obviously, he didn’t know everything that could happen. Likewise, we didn’t know about this area that is so dangerous. It’s very difficult to understand the reality of a country so far away. There isn’t much information,” notes his father, with tears in his eyes. Uusi Tuuli (New Wind) is a Finnish non-profit organization that Jyri became involved with shortly after turning 20. Its goal is to promote international solidarity, “just” international economic treaties, peace and mutual understanding between peoples and nations. The organization that Jyri Antero Jaakkola belonged to for ten years has a merchant ship called Estelle, with which the 33-year-old young man delivered, with his comrades, humanitarian aid to Bangladesh and Angola. “Our main objective is Finland. We want to have more ‘fugitives from consumption’ join us. This is essential, as the world’s problems are largely caused by the rich, not by the poor,” says the organization’s website; a philosophy that Antero Jaakkola shared. In preparation for his trip to Mexico, Jyri learned to speak Spanish in two months. 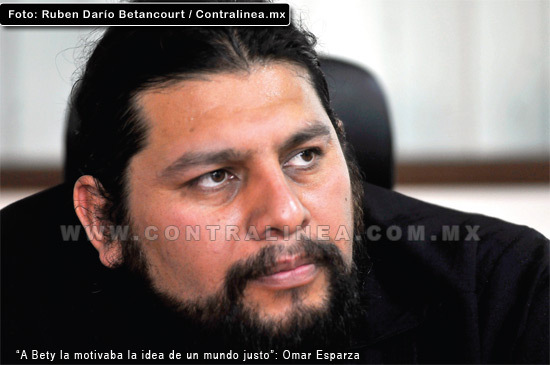 With his knowledge of Portuguese, he quickly developed the ability to communicate with his Oaxacan comrades and to give workshops on “just trade” in the region, says his mother, with whom he had last spoken six months before his death. Now, “our lives have changed because we’ve had to deal with the bureaucracy of the embassies, to go before the authorities and ask that they detain those responsible. However, we don’t know what it will be like when we return to our home and we have to lead a normal live,” explains Jyri Antero Jaakkola’s mother, before she starts crying. “I should change my last name to Guerrero [Warrior],” and brandished her left arm in a show of strength. She had just signed off on perhaps that last email she would send. She smiled, but then let it fade: “I’m afraid, believe it. Things are never easy.” These were her words before leaving with the caravan to San Juan Copala. 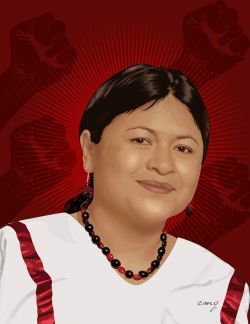 Originally from Chila de las Flores, Puebla, Alberta Beatriz Cariño Trujillo was the first to die at the hands of paramilitaries while she traveled in the peace caravan heading to the Autonomous Municipality of San Juan Copala, this past April 27. The daughter of farmers – the oldest of three women: Alberta, Rebeca, and Carmen – Bety was the driving force behind development projects in communities in Puebla and Oaxaca. Omar and Bety said goodbye in the community of Agua Fría, just 20 minutes before she and the group of more than 20 people were attacked with high-powered weapons. “I asked her not to go. We didn’t talk about this, we didn’t discuss it like we do before each trip,” he recalls. — She said that she was scared – it is commented to him. — Yes. We’ve lived through a lot of harassment. Twenty days before, two soldiers outside of my house beat me when I asked them to leave. It was nearly midnight. Bety was with the children and we had to call the police in order to get them to leave. “On April 27, there were clear threats; warnings from Ubisort that I would not be allowed to enter,” claims Omar. Alberta Cariño Trujillo earned a Bachelor’s in primary education in Tehuacán, Puebla. She continued studying in her home state as well as in the Oaxacan Mixteca. Before she was murdered, she had finished her first year of a Master’s in community development at the Center for Rural Development Studies, an educational institution located in the northern mountains of Puebla. Later, she lived, together with her family, in Huajuapan de León, Oaxaca. Since 2006, she supported development projects in the region. “We began microcredit projects for women, we fought for land for marginalized communities so that they could receive basic services (water, electricity, sewage); she taught children and adults to read,” says Esparza Zárate. “This is how we spent 15 years together, in the struggle for the rights of the people. She was motivated by the idea of a just world. She learned this growing up close to a progressive church where Liberation Theology taught her to share equally. “I met her during an election in Tehuacán. We were election observers. We became comrades, then a couple and from there worked on communitarian economic projects which would allow the people to build in their own communities with their own funds. We understood that nothing is ours and that what we do have must go to help others. Following this same logic, the people from our community brought food to our home: beans, pastas, oil; that’s how we all lived. And from that, Cactus was created,” he comments. The same year that social discontent erupted in Oaxaca, the violence in the Triqui region began. “It’s not a new thing. Many governments have let this happen and have financed this violence. “With the 2006 movement and the aim of creating an Autonomous Municipality, several organizations around the state began to get involved. It was analyzed for many months. We began to work with community radio stations because we knew that they are a tool to provide visibility to the communities’ struggles,” says Esparza. Bety participated as the director of Cactus and both of them as adherents to the Other Campaign. “Our work was always to move forward processes that would allow us to create another kind of politics, because we’ve already seen that the Mexican state has no interest in resolving the problems the communities face. We brought up proposals that the people grow food for their own communities. We saw Copala as being one of those places.